Lesa and Alex. Judging from their punkish haircuts it could be dated in 1977-78.
may be just a footnote in the big star myth, famously namechecked (and begged for…) in the hit-that-never-be “Kizza Me” (“Kizza Me/ Lesa, Why Not? ), Lesa Aldridge (or Lisa Aldredge as she’s often spelled) was the main inspiration behind Third. 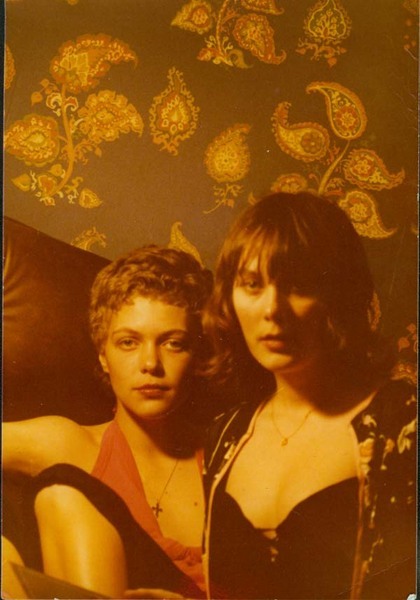 The nephew of one of the greatest american lensman, William Eggleston, who portraied the sheer, breathtaking beauty of her youth in a famous shot titled “They needed to Talk” and published in a previous post (you can read its complete story here). Lesa (Elizabeth) Aldridge was a senior in high school when she began to date Alex Chilton. That stormy, often violent relationship provided the main body of the songs that made Third one of the best record ever. Their first encounter is mYthologized in “Kanga Roo”, their erratic nightlife in memphis is narrated in “Nightime”, the purity and uniqueness of their romance is sung in “Dream Lover”. But Lesa wasn’t only an unlikely teenage muse, she collaborated in many ways during the recordings. As Rob Jovanovic wrote in his Big Star: The Story of Rock’s Forgotten Band: “Lesa Aldridge added the High- School-French backing vocals which Dickinson was adamant should stay on the album. ‘Lesa was a big, big part of the record,’ he said. ‘Alex reached a point in his creative process where he started to go back and erase her -there was a lot more of Lesa on the album than there is now but I stopped him. I said you can erase this, you can erase that, but this stuff is staying’. (…)”. She co-wrote “Downs” and Sung main vocals in the Kinks cover “‘Till The End of the Day”. Her vocal take was eventually erased and replaced with Alex’s. Lesa with an unidentified girlfriend. 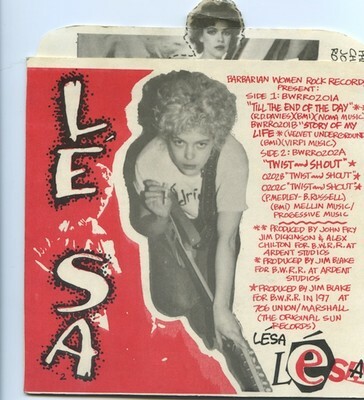 But Lesa’s version ended up in a rare EP titled Barbarian Women in Rock published around 1980, along with an other Velvet Underground cover, “That’s The Story of My Life” (Lesa was credited to have introduced Alex to the VU, transforming him in a Memphis Lou Reed) and a Beatles one, a rough, ramshackle “Twist & Shout”. The Ep cover plus insert. After she split with Alex she played (and still does…) in the Klitz, an all female punk rock band from Memphis (check here and here), married another musician from memphis, the late Tommy Hoehn and she teaches English in a college.